by Gordon E Perrigard, M.D. 294 pages, 5.5" x 8.5"
Arwrology is derived from the old Welsh word arwr, meaning an all-out hand-to-hand fighter. 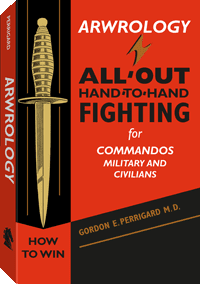 It was developed by Gordon E. Perrigard, a Canadian medical doctor who combined his knowledge of advanced ju-jitsu with his knowledge of human anatomy to come up with this devastatingly effective close-in combat system. Arwrology was originally released in 1943 in Canada for use in training combatants for World War II. Martialists from all over the world quickly hailed its superior fighting methods, and today it remains one of the most highly sought after – and most valuable – fighting manuals in the world. Don't miss your chance to add this authentic reproduction of an extremely rare combat classic to your library at a price you can afford.